The provision of health services is a team effort involving many professions. The pharmacist is an integral member of this multi-disciplinary team. The Pharmacist’s role is to optimize the use of medication so as to ensure better patient outcomes. Being the final link in the medication chain, which is designed to ensure the quality, safety and efficacy of all medications delivered to the patient, one of his/her most important functions is to ensure that the patient understands how his/her medications shall be taken, what they are for, and the duration of his/her therapy. It is important that the pharmacist reinforces the relevant advice necessary for the proper use of medications, including providing patients with appropriate information leaflets. It is also important that the pharmacies shall be designed, equipped, organised and maintained to fulfil their essential role in the protection of public health. As a healthcare professional, a pharmacist is duty-bound to continually upgrade himself/herself and to observe the Code of Ethics. 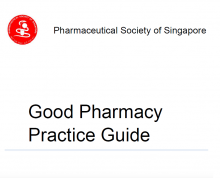 This guideline aims to provide guidance on good pharmacy practice in Singapore. It includes recommendation for suitable premise, equipment and storage of medications, good dispensing practices, inventory practice, review of medication orders, counselling points, recommendations to mitigate dispensing errors, role of pharmacists in health promotion, training and competency, code of ethics,disposal of medications, and hand carried export sales of medications.